Last Monday, Don, Colin, Chris and I headed up to Downing Mountain’s back bowls. The weather was variable sunny and we skied a few runs on the crown. 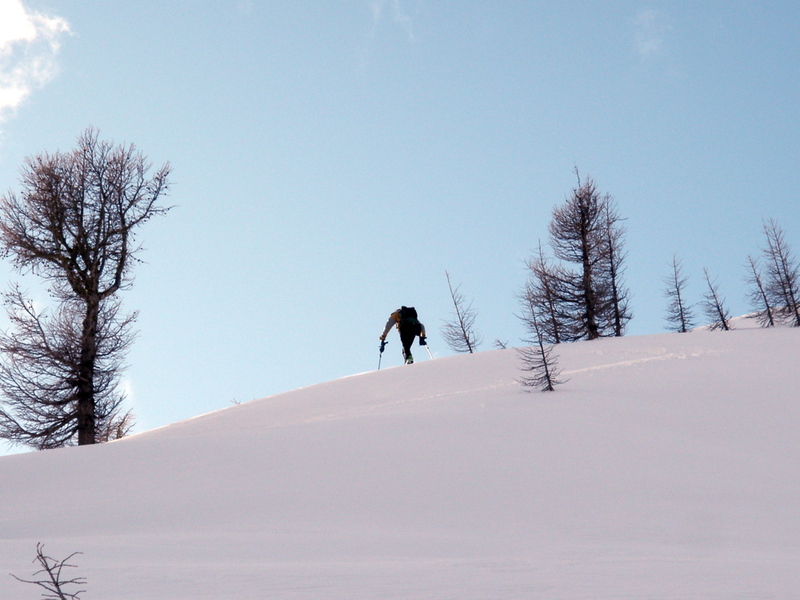 It was a pleasant day out on nice terrain with good surface conditions. Making the most of it with our shallow base, the surface conditions have been remarkably pleasant. Tuesday I hauled another load of firewood to the lodge as with the constant demand this winter we have been going through quite a bit more than last year. 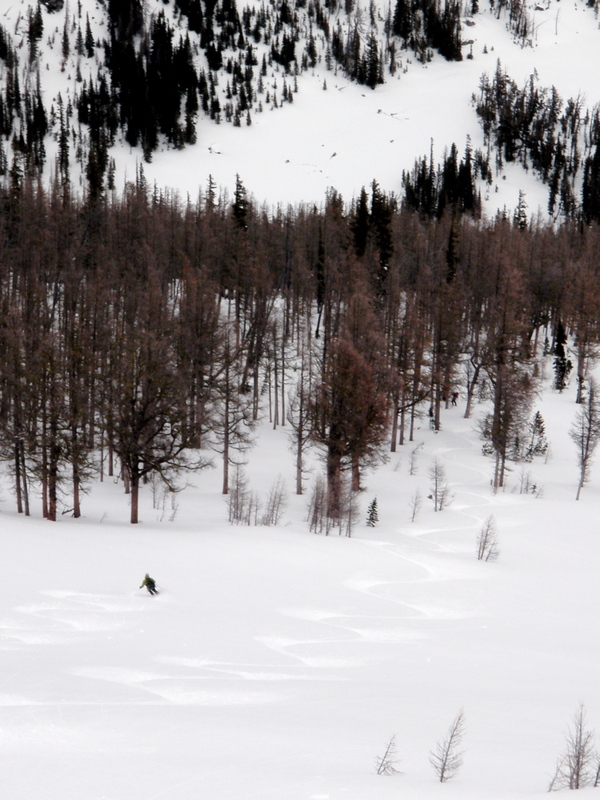 Wednesday, I toured out the Continental Divide with Don, Joe, Greg, and Bob and with the fresh snow and fat skis enjoyed some decent powder skiing on the old tracks in the meadows. With only about three feet of snow total there was some rotten sugar snow to be wary of sinking into on occasiion. 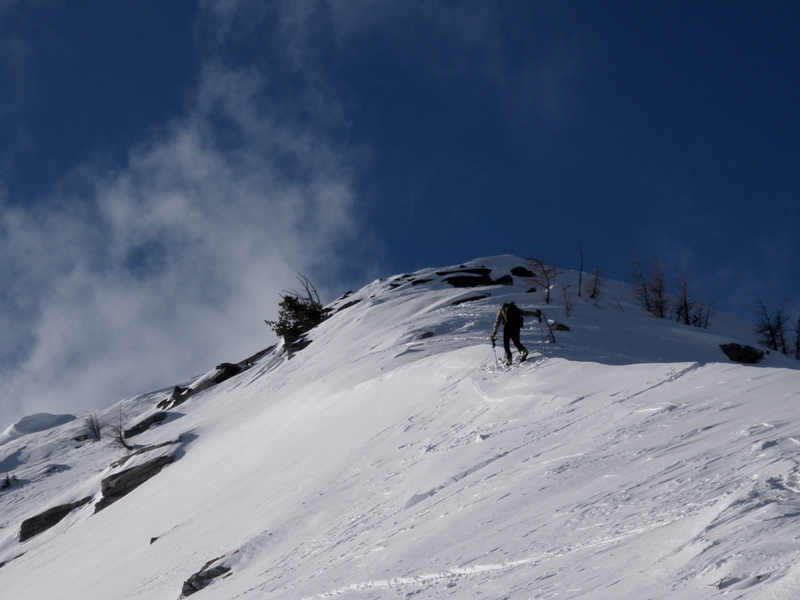 On Friday, Bob, Joe, Don and I skied an obscure west face up Lost Horse Canyon and found some beautiful terrain on a 2000′ falline, decent snow with no wind affect, hot sunshine and NO other tracks. By the end of the day wet slides were a worry on south and west faces. Saturday’s crusts, found me skiing with Colin and Erik and we toured up St Joseph Peak to ski the north and south aspects, finding great terrain, decent coverage and variable snow with wind crusts on north and south aspects as well as weak sun crusts on east aspects and bomber sun crusts on south aspects. I forgot my camera each day, for shame as there were some great photo opps especially on the blue bird day up Lost Horse. My partners remembered theirs so I hope to snag a few before too long. This passed week was my best of the season with the new snow having freshened up the slopes nicely and the continued settling and strengthening of the 3-4 four base making for a continuing better platform. We do however need a good storm yet to seal us in for the winter and some wind would be nice to get some snow under the trees and into the typically windloaded bowls and couloirs. Hopefully this storm will materialize before April! 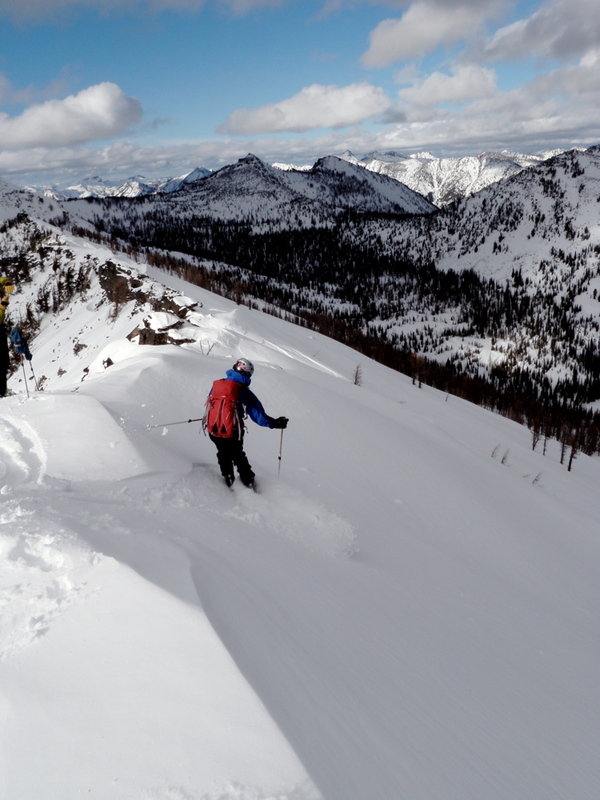 Don, Tim and I headed up to Camas Peak on monday to try to sneak a few good turns into this great tour. Lucky we were to arrive at the summit with blue skies and just a light breeze. The pit we dug showed numerous weaknesses as described by the forecasters. The problematic ones in the 135cm deep snowpack at 8500′ were at about 115cm and at 75 cm where there were clean shears around CT12-13. There was friction however and we rated the quality at two. With the yellow, caution light this presented we skied the north face as tenderly as we could, careful to avoid the rollovers and shallow spots when we could. 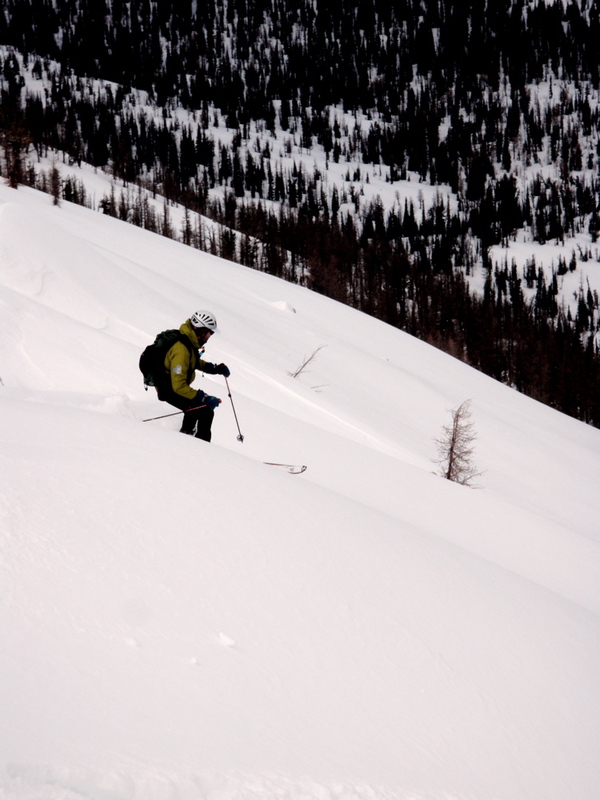 The slope stayed together and we reascended the peak to ski the powdery north face another time. The snow was shallow and fast powder and very FUN! 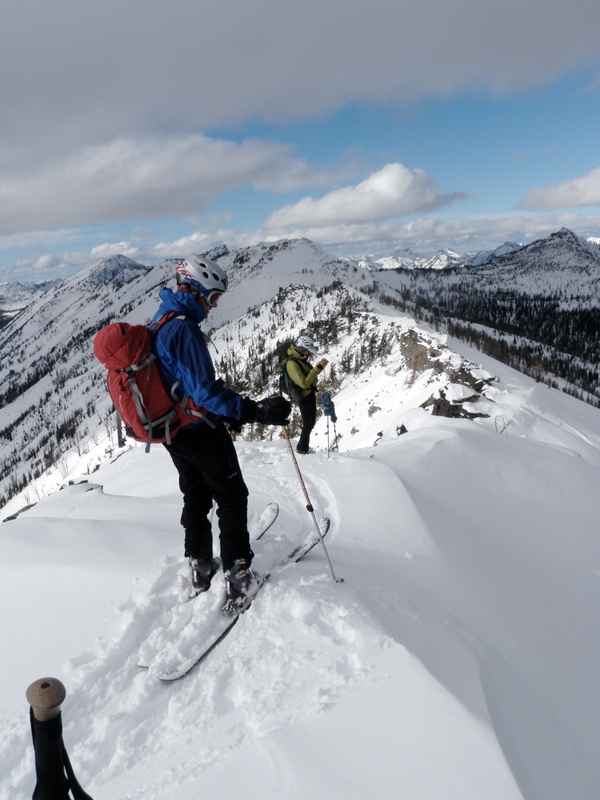 We continued down the north face and skied through the narrow gully at the cliff band that allowed passage through to the second Camas Lake. From there we turned right and toured out the drainage and back to the trailhead where the truck was waiting a switchback below. At under seven hours, we made good time in the fast conditions.